Until recently the reliable measurement of oxalate in plasma presented considerable problems. Primarily, this was due to the extremely low level of the anion in plasma. The range of oxalate levels reported in normal plasma varied enormously (see Table 4.1). Such wide variations in the levels of oxalate in plasma probably arose from the difficulty in developing highly sensitive and specific assays to detect the low level of oxalate in plasma and also from the rapid in vitro oxalogenesis from glyoxylate (Akcay and Rose 1980), ascorbate (Kasidas and Rose 1986) and other precursors (France et al. 1985) during the storage and processing of samples. 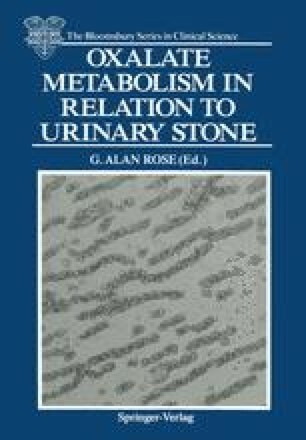 The problem of oxalogenesis from ascorbate in urine was discussed in Chapter 2. In plasma, because of the neutral/near-alkaline pH environment and the relatively higher concentration ratio of ascorbate to oxalate which is normal in this matrix, oxalogenesis from ascorbate may pose even greater problems (see below). In vivo radioisotope assays (Williams et al. 1971; Pinto et al. 1974; Hodgkinson and Wilkinson 1974; Constable et al. 1979; Prenen et al. 1982) have consistently yielded plasma oxalate levels in normal subjects of 0.4−2.8 μmol/l whereas the earher in vitro assays (see Table 4.1) produced values ranging from 30 to 300 μmol/1. The gap between the two approaches for determining plasma oxalate has narrowed considerably as a result of recognition and subsequent correction of the problems arising from spontaneous in vitro oxalogenesis and the development of highly specific and sensitive assays.